down into the wild oats in the field below the barn. somebody there, somebody from home." What a beautiful quote, and it's lovely to see one of your self-portraits again. 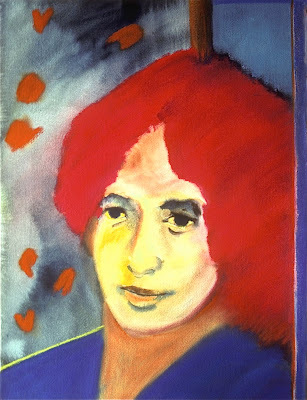 The woman in the painting is someone I imagined as a sister of Bob Dylan, rather than a self-portrait. Thanks for picturing me that way! Jakob in today's 'Sunday Times' looks the spitting image of his dad! I've been listening to "Seeing Things." After the first play, I put it away for several weeks. Then I got it out again and began to appreciate it. Not so much for the lyrics. It's the sound of the music that moves me. And you don't have to be my girl." Those lyrics I took to heart. Jakob Dylan is his own man. I like that about him. I'm not much of a comment leaver these days. still drop by, though. be well. Thanks for stopping by, R.L.